Hello, Welcome to my personal website. My name Dwicky Pramudita. 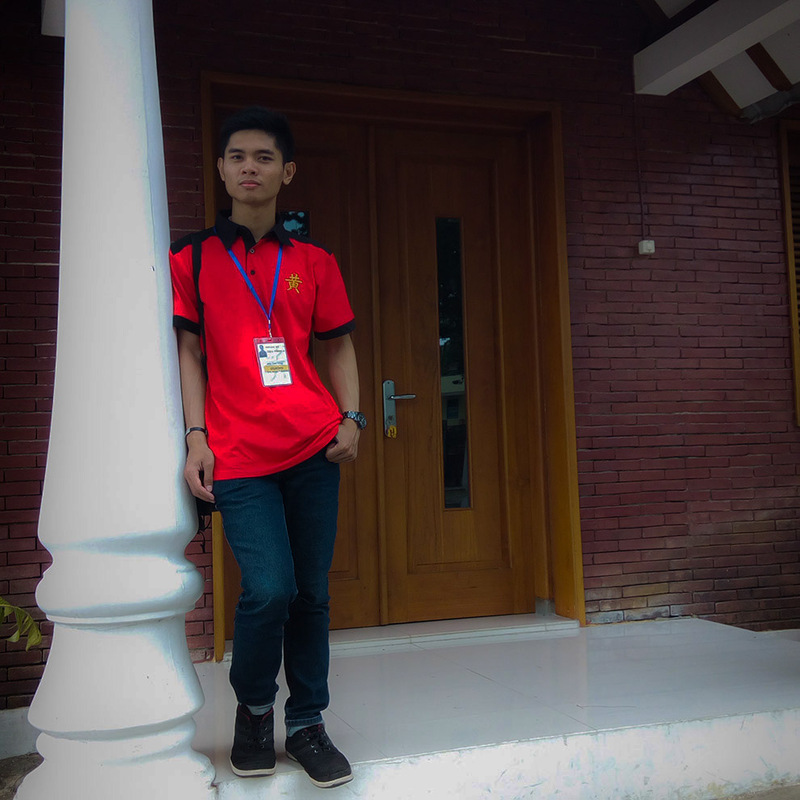 I’m work as Web Developer especially as Back-End Developer from Cilacap, Indonesia. 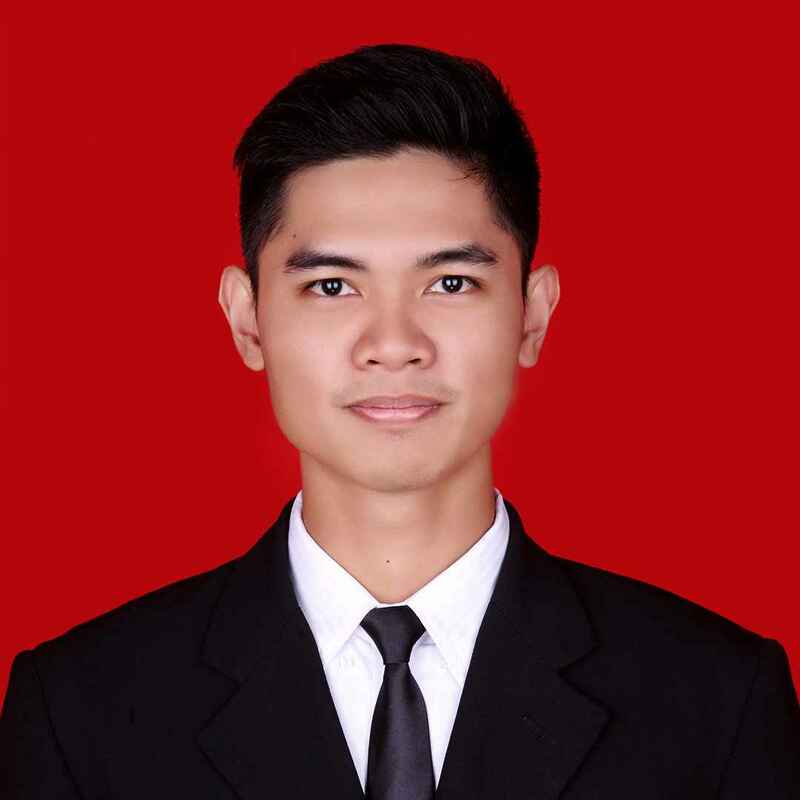 i'm an IT graduate from Duta Wacana Christian University. Proficient in programming and user interface design. Familiar with various programming languages. I also experience working in projects such as the development of desktop applications, mobile and web with ability to work individually or in team. I’m an hard working, flexible, honest, focused, trustworthy and willing to work in a changing and challenging environment. I’m a friendly person, I work well in a team but also on my own as I like to set myself goals which I will achieve. I am well organized and always plan ahead to make sure I manage my time well. I offer Christian Church Website building services to support the service. The system is also available in android apps. I offer the services of making a classy company profile that can reflect your company. Because the quality design will add a good image in the eyes of prospective customers and investors. While studying at university and working in a company I studied several programming languages. I use these programming language to make mobile, desktop or website applications. In the process of making an application or other work requires a tool or supporting application. The following is a list of applications that I normally use. Menjadi founder dan membuat sistem backend dengan menggunakan CakePHP 3. Web Developer with jobs description like manage, design, build and maintain web based system namely Clinictronic's Information System and and Ramasakti Tour and Travel. Responsible for managing many things such as records sales and purchase order, accounts, customer, employee, user and warehouse management and some other things. 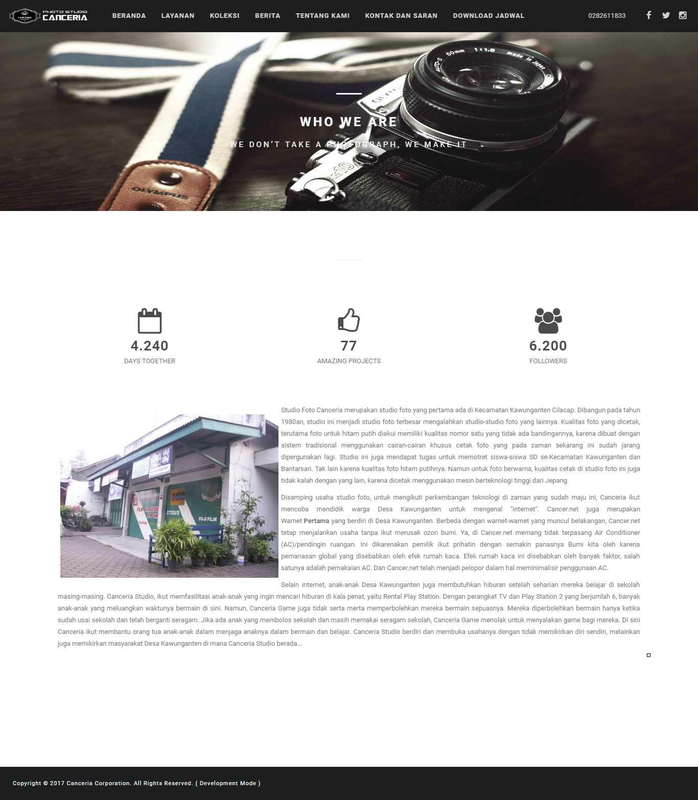 Worked with CakePHP 3.0, JQuery and MySql. I am studying in SMA Negeri 1 Cilacap for 3 years. I majored in Social Sciences.
" Dwicky is great peer of working. We've ever worked together in the same project and he would finish his task as fast as possible. He also ambitious to learn new things from scratch. " " He is one of the best learner and also hard working developer i have ever met. I really happy to meet n know him. 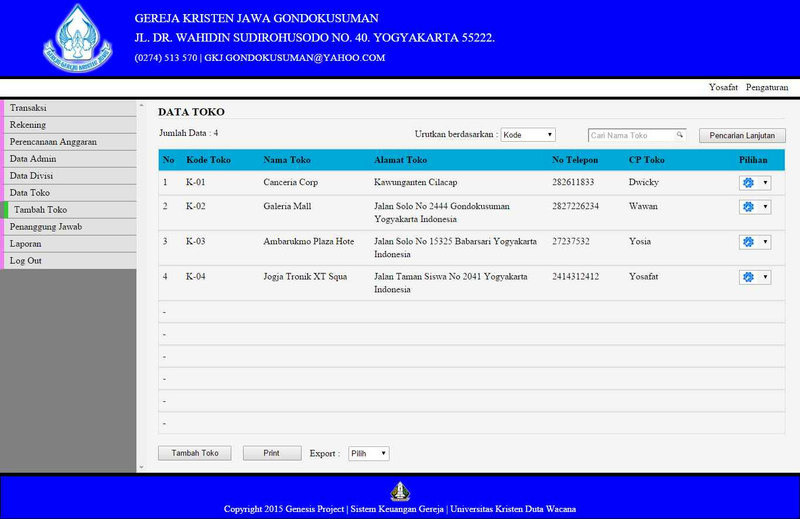 One of best developer in university. " " Dwicky and I often attend same classes during our study in university. We also often work in the same team. I think he is one of the most diligent student in the class. His score is good and usually above the class score average. He is not only good in theory, but also in practice. 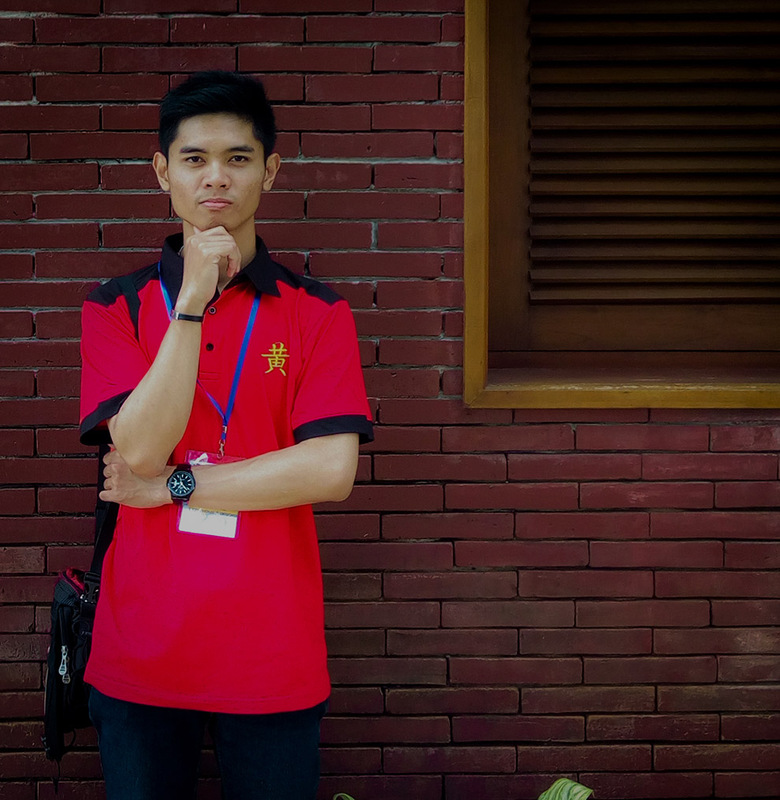 He is good in both user interface designing and programming, so he is suitable as both frontend and backend engineer. " " Dwicky is a good friend. My experience working with him was incredible. He is a fast learner, hardworking and easy to work in teams. He is always open to criticism or advice. I'm happy to work with him again. " 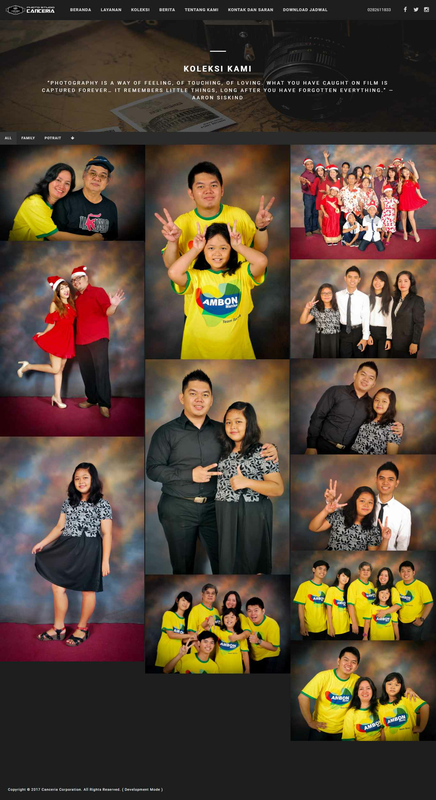 " I've had the pleasure of collaborating with Dwicky Pramudita on some projects. He is one of the dilligent and creative web developer. One of the main qualities that Dwicky brings to the projects he's pay attention in detail. " When I study at a university, work in a company and become a freelancer, I successfully complete tasks and projects such as websites, mobile and desktop applications. The following is a list of applications I've made so far. PT. Cettabumi adalah merupakan perusahaan konsultan yang fokus pada bidang jasa survey pemetaan. 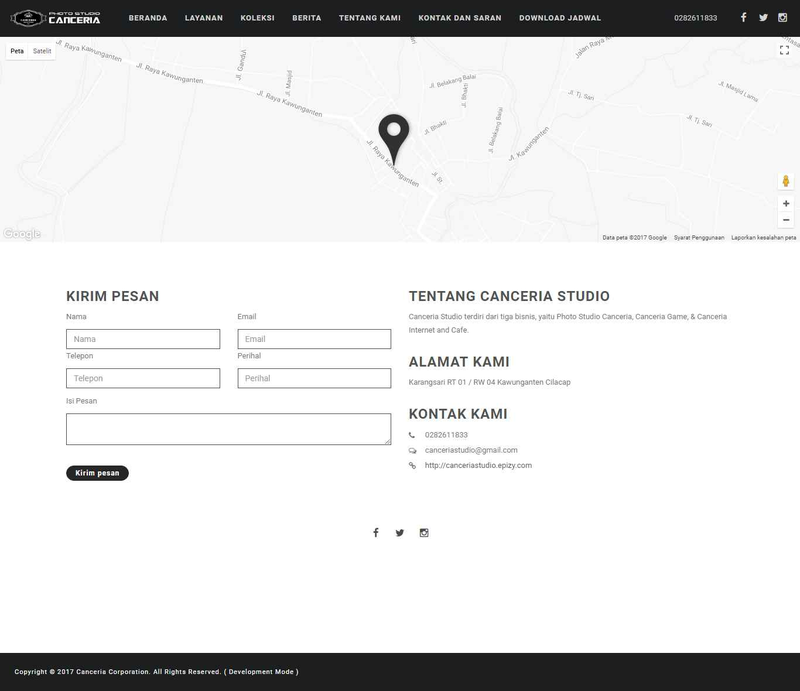 Website ini dibuat agar client ataupun calon client dapat melihat informasi lebih jelas mengenai PT. Cettabumi. 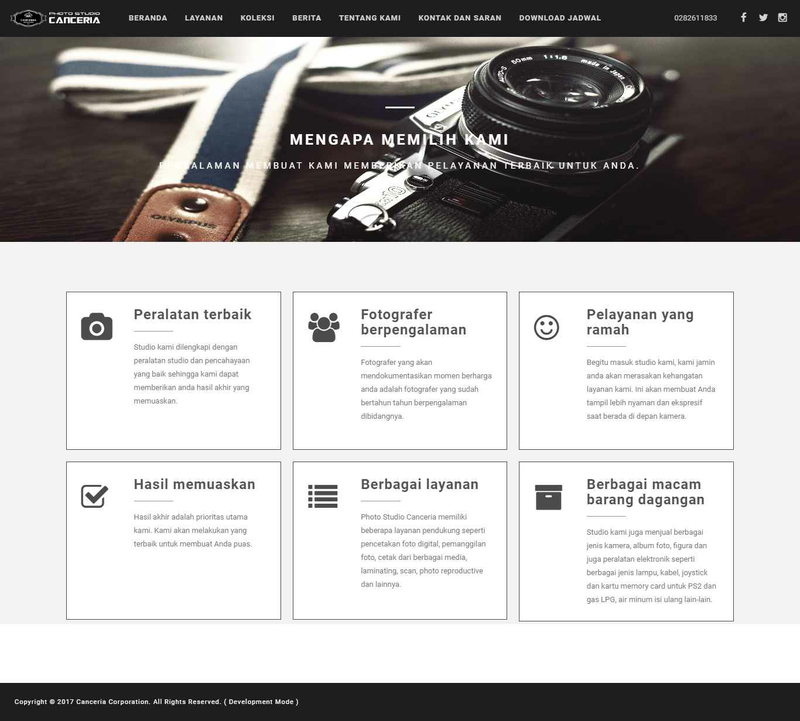 Saya membuat website ini dengan menggunakan framework CakePHP dan komponen dasar website seperti HTML, CSS, dan JQUERY. 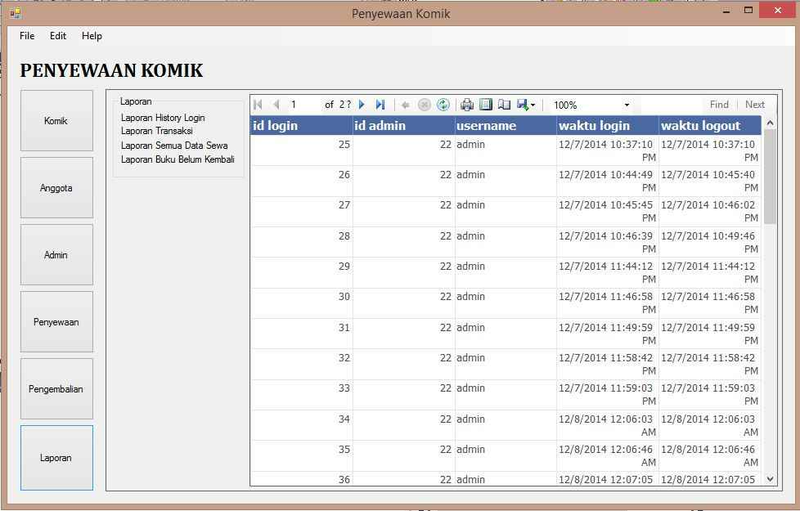 Bagian backend website ini mempunyai fitur Administrator, manajemen pesan dan manajemen konten. 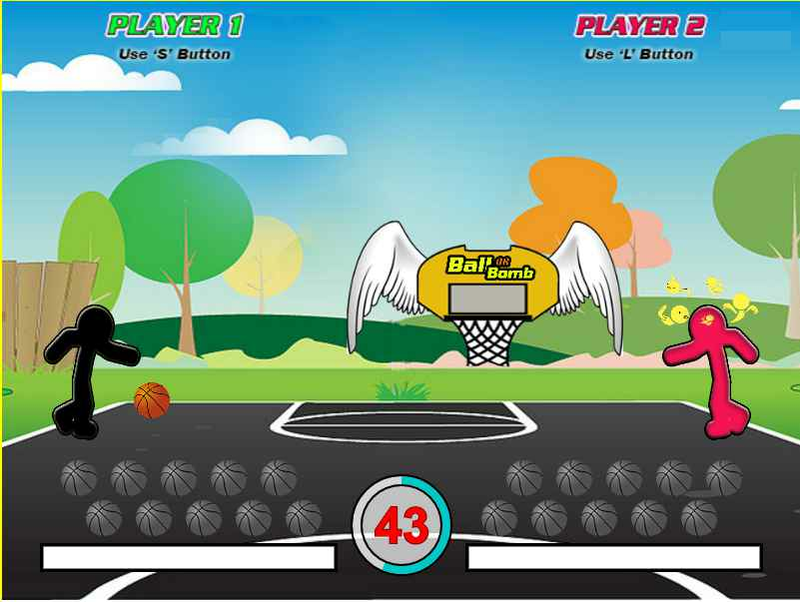 Jago Kerja is an application that is ready to help solve problems at home. Users can find professional and trusted craftsmen with ease and of course with a cheap price. I created the admin part of the Workspace system. The parts I work on in this system include Administrators, Customers, Partners, Booking, Scheduling, Cash, Messages, Advertisements, Subscription Orders, Vouchers, Surveys, Reports, Banners, Announcements, Stores and Settings. I still hold and maintain the Jago Work system up to now. 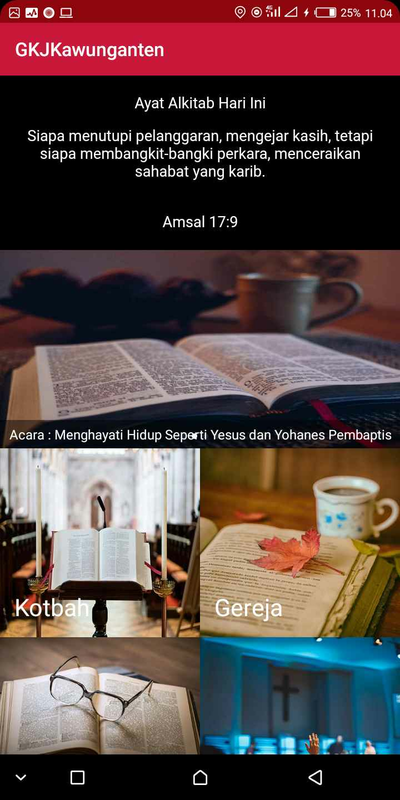 GKJKawunganten adalah aplikasi android untuk gereja saya di kawunganten Cilacap. Gereja saya bernama GKJ Kawunganten. 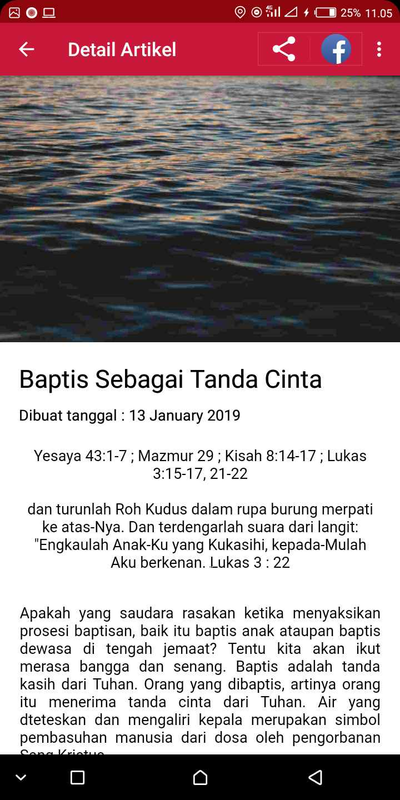 Saya membuat aplikasi ini dengan tujuan agar jemaat gereja dapat mengetahui informasi yang berkaitan dengan gerejanya dan pihak gereja dapat dengan mudah menginformasikan informasi kepada jemaat. 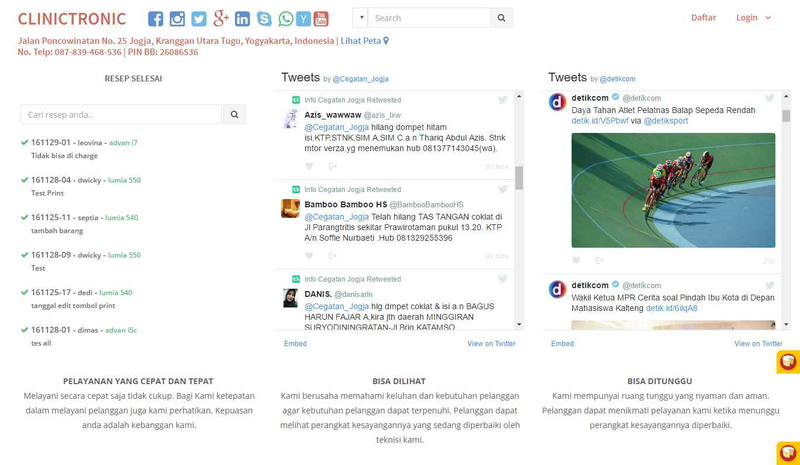 Aplikasi ini terintegrasi dengan www.GKJKawunganten.org sehingga pengguna aplikasi akan mendapatkan informasi sama seperti yang terdapat didalam website. Pengguna juga akan mendapatkan notifikasi apabila terdapat admin yang memposting kotbah atau artikel. Saya membuat aplikasi ini menggunakan Android Studio. 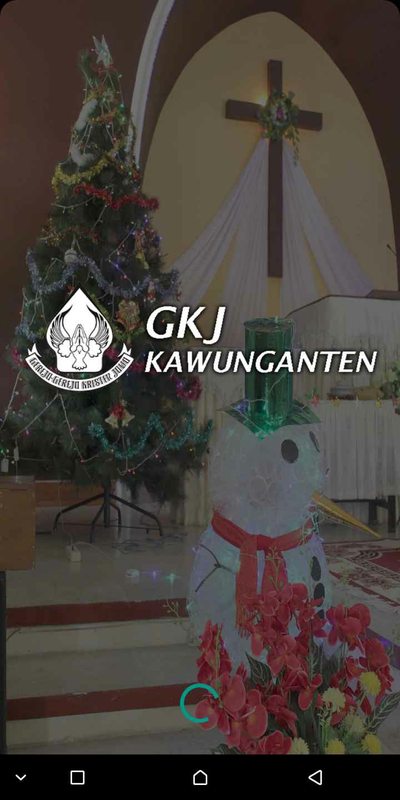 www.GKJKawunganten.org adalah website untuk gereja saya di kawunganten Cilacap. Gereja saya bernama GKJ Kawunganten. 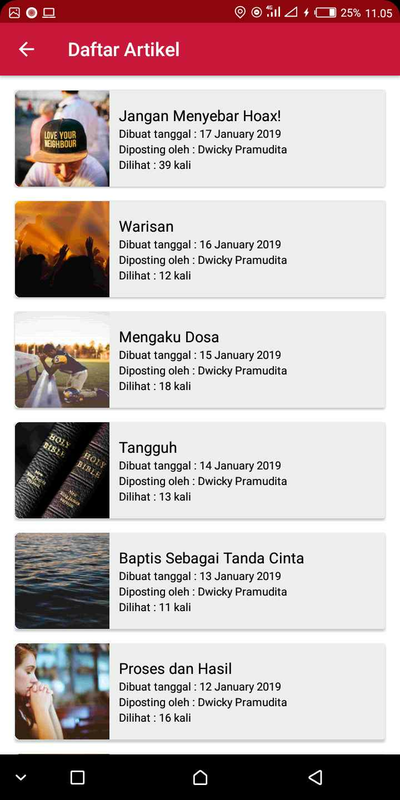 Saya membuat website ini dengan tujuan agar jemaat gereja dapat mengetahui informasi yang berkaitan dengan gerejanya dan pihak gereja dapat dengan mudah menginformasikan informasi kepada jemaat. 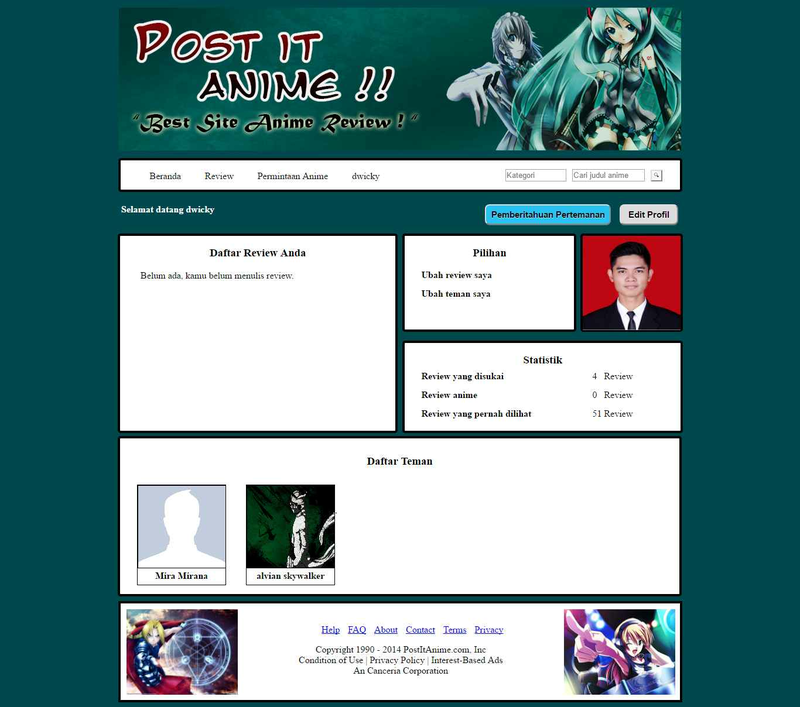 Bagian frontend website ini saya buat dengan menggunakan template sedangkan bagian admin atau backend saya sendiri. 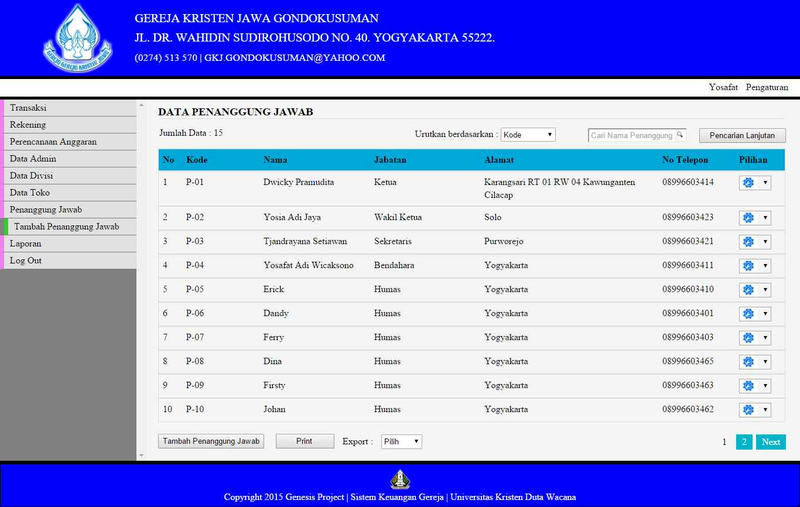 Ada banyak fitur yang terdapat didalam website ini diantaranya : Administrator, Pengaturan data gereja ( Profil, Pelayan, Komisi, Pos Pelayanan ), Pengaturan Konten ( Kotbah, Artikel, Acara, Donasi / Sumbangan, Arsip file / Warta, Album, Produk ), Pengaturan halaman front-end, Pesan dan Pengguna. 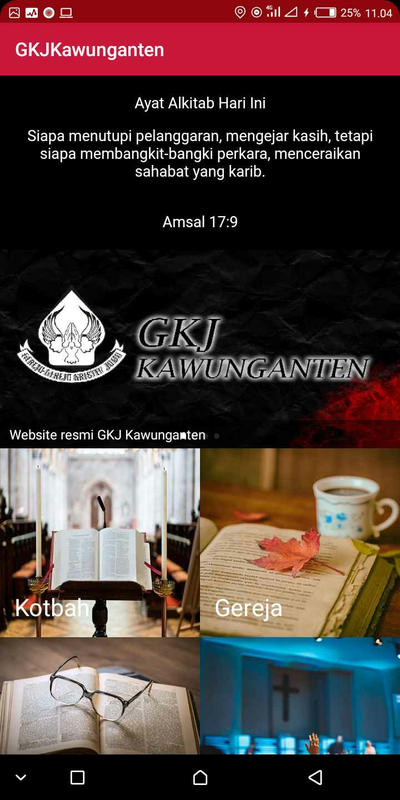 Website ini juga diintegrasikan dengan aplikasi android yang bernama GKJ Kawunganten. 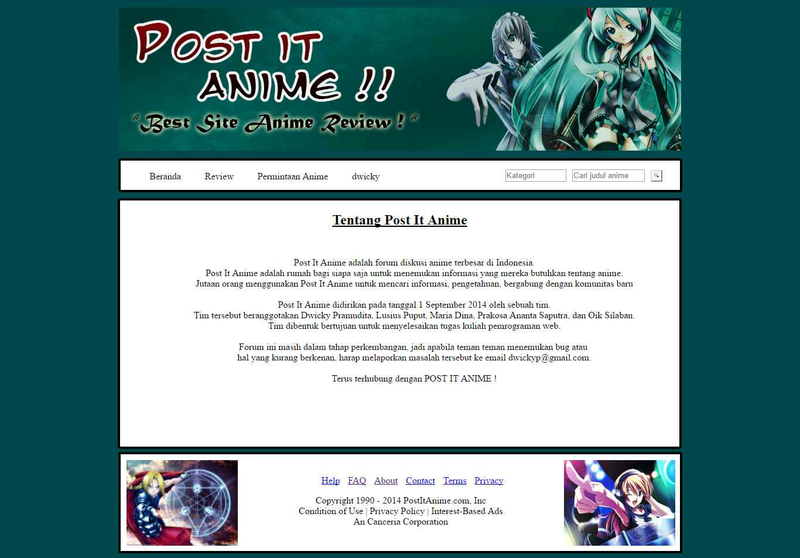 Saya membuat website ini menggunakan CakePHP 3 dan Mysql. Dwickypramudita.com is a personalized website created for individuals and used for personal career marketing by containing a list of the individuals' skills and experiences and CV, social networking with other people with shared interests, and as a space for personal expression. This website has features such as admin, privilege, employees, blogs, feedback and interface management features that contain some personal data settings, education and job history, certificates, achievements, skills, portfolios, resumes, services, and some other settings. 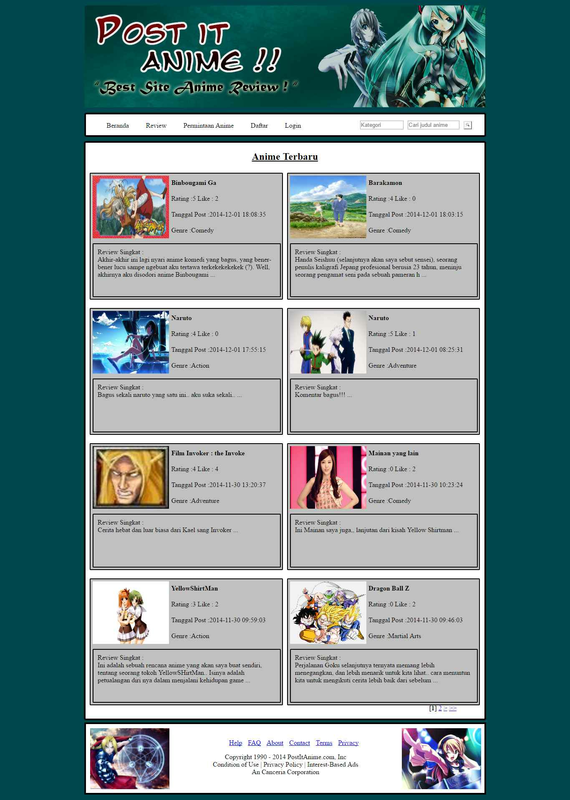 This system is built using CakePHP3. 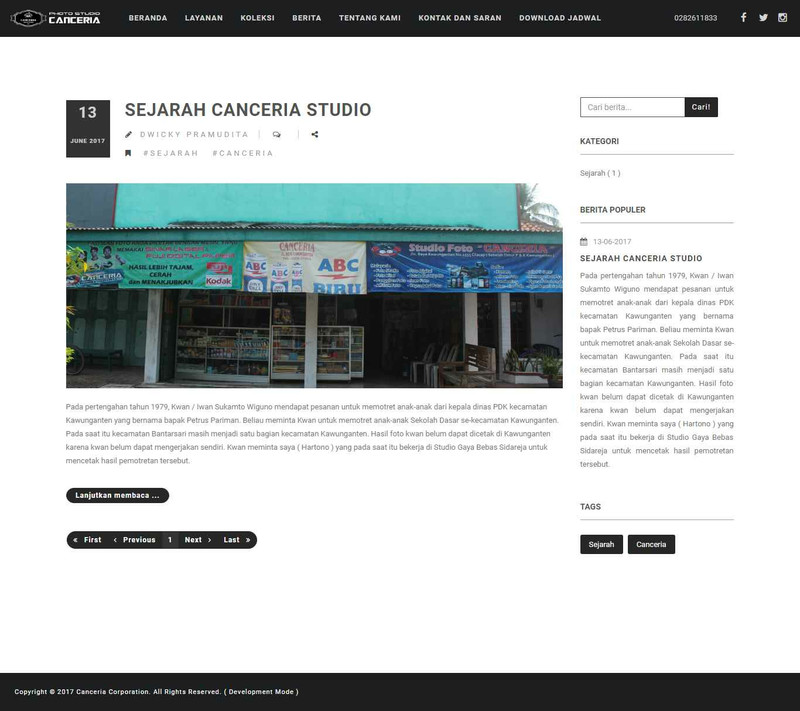 CanceriaStudio.com is a company profile website created for the promotion of a photo studio called canceria. This website has features such as admin, privilege, staff, blog, feedback and interface management features that contain settings about corporate data, header slider, service settings and company portfolio and more. 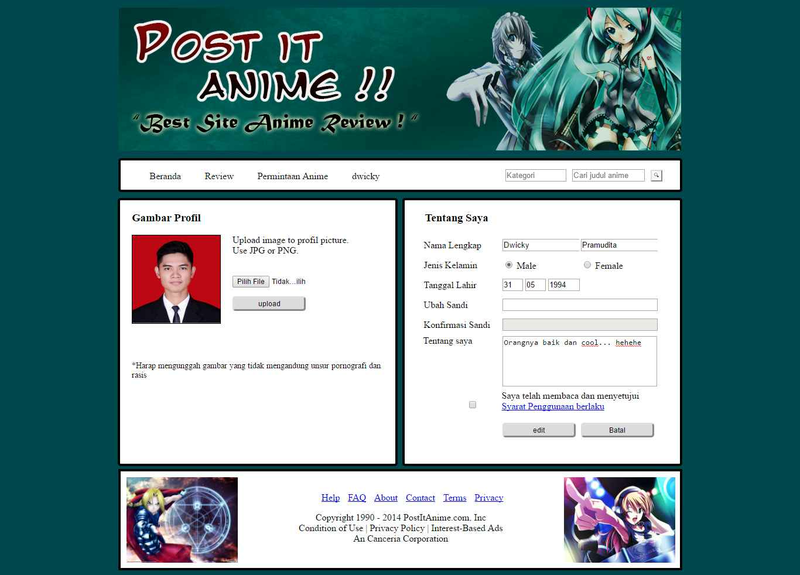 This system is built using CakePHP3. Ramasakti information system is a system created for travel agents called Ramasakti. This system is made to facilitate the management of the company's business. This system has features like admin, privilege, employees, customers, ticket recording, vehicle recording, warehouse, asset, salary management, and much more. 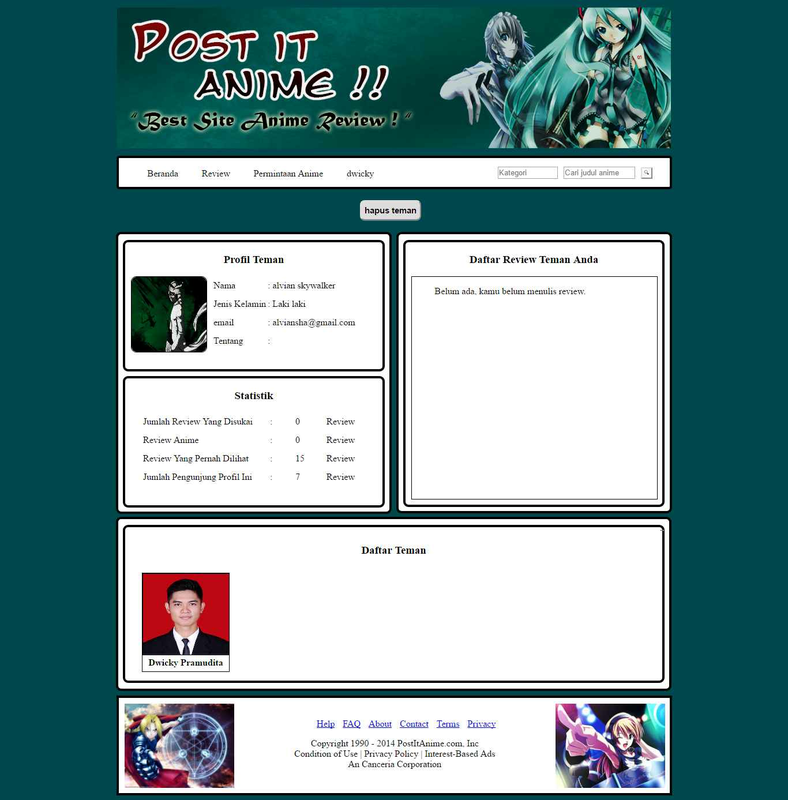 This system is built using CakePHP3 and Mysql. Clinictronic information system is a system created for a business place called clinictronic. This system is made to facilitate the management of the company's business. This system has features like admin, privilege, employee, customer, product recording, spare part recording, workorder, recording sales and expenses, notifications, and many more. 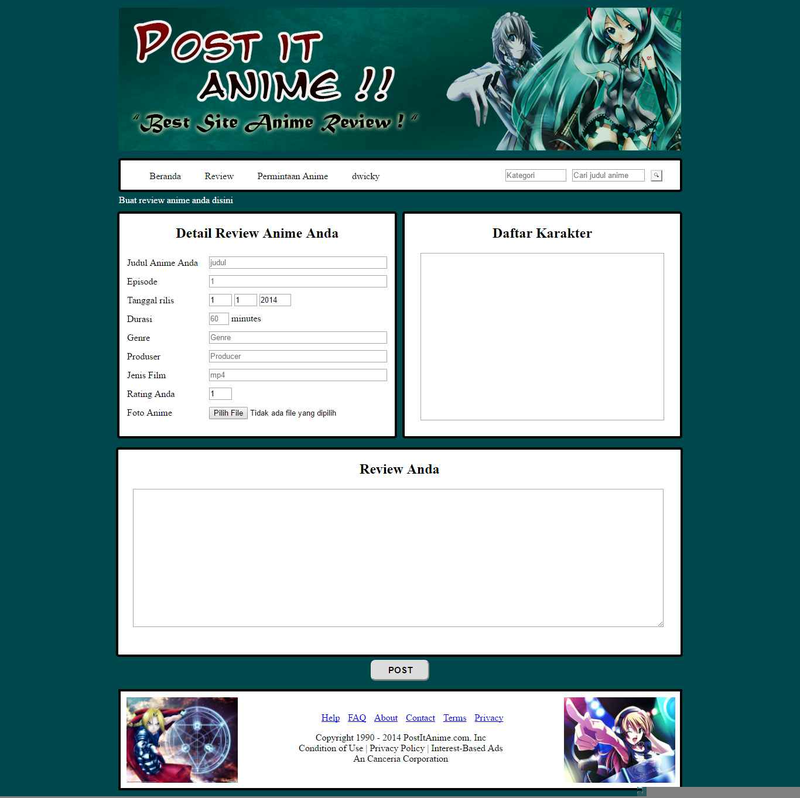 This system is built using CakePHP3 and Mysql. 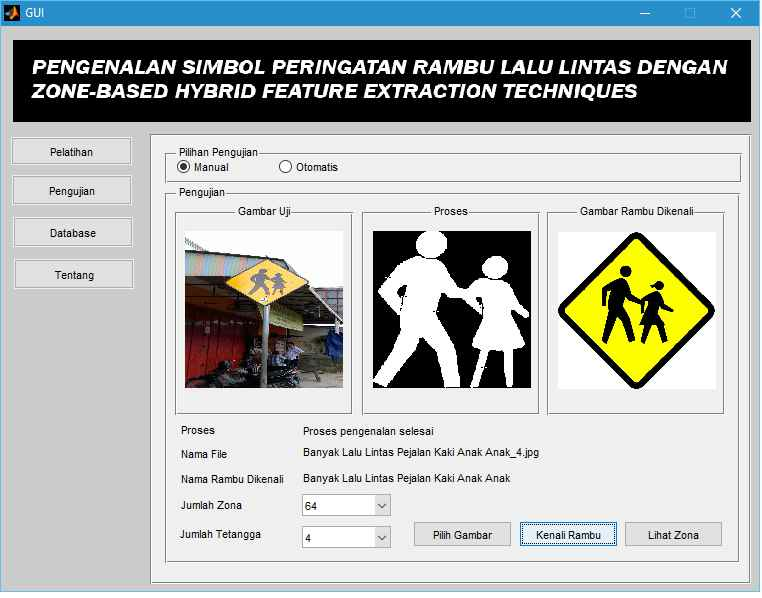 This research discusses the zoning as feature extraction method for recognition of warning symbols on traffic signs. Zoning feature extraction methods used in this research is a hybrid method which combines ICZ and ZCZ. The number of zones used are 9, 16, 25, 36, 49, 64 and 81 with a tilt angle of -5, 0 and 5 degrees. Euclidean distance is used as a method for recognition. The research compared the number of zones and tilt angle to find the best recognition results. The church's financial information system is a system designed to help budget managers in church finance activities. The manual recording system is difficult to develop as church congregations grow, and this system is designed to make management more effective, efficient and directed. 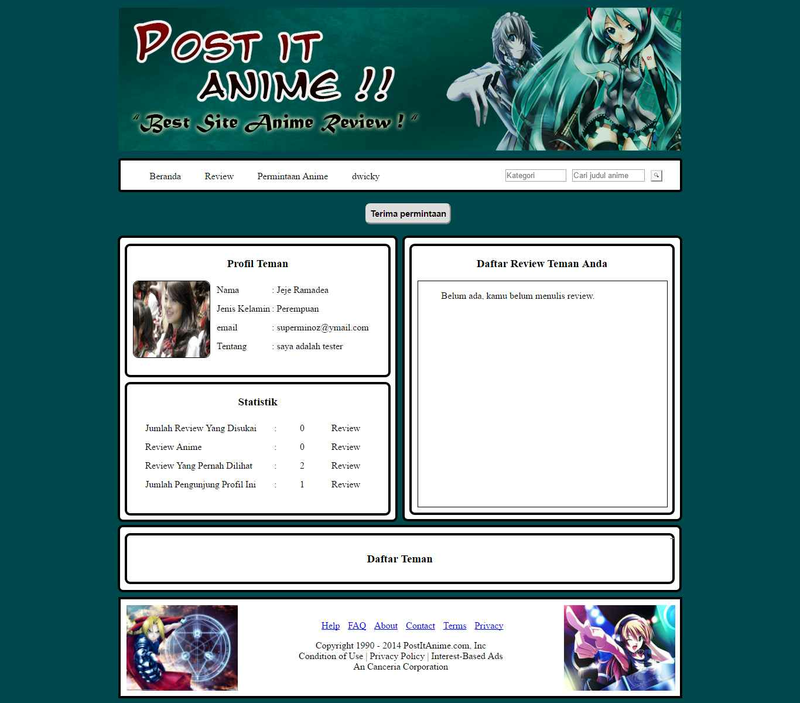 This system was created using PHP, HTML5, CSS, JS, Ajax and Mysql. Jogja Food is a mobile app that is targeting culinary lovers in jogja. For restaurant owners, they can use this application for promotion, and as a normal user they can search the restaurant according to the desired criteria. This app was created using android studio. 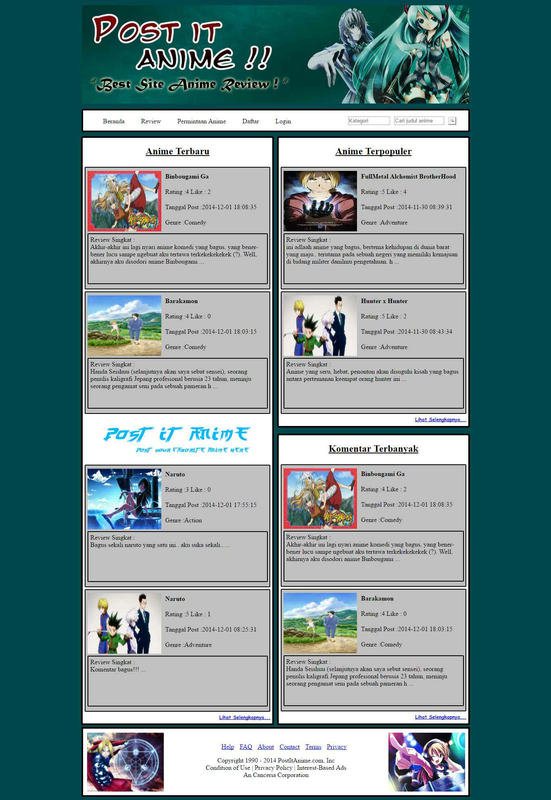 Post it anime is a website that can accommodate every experience and information from anime lovers. 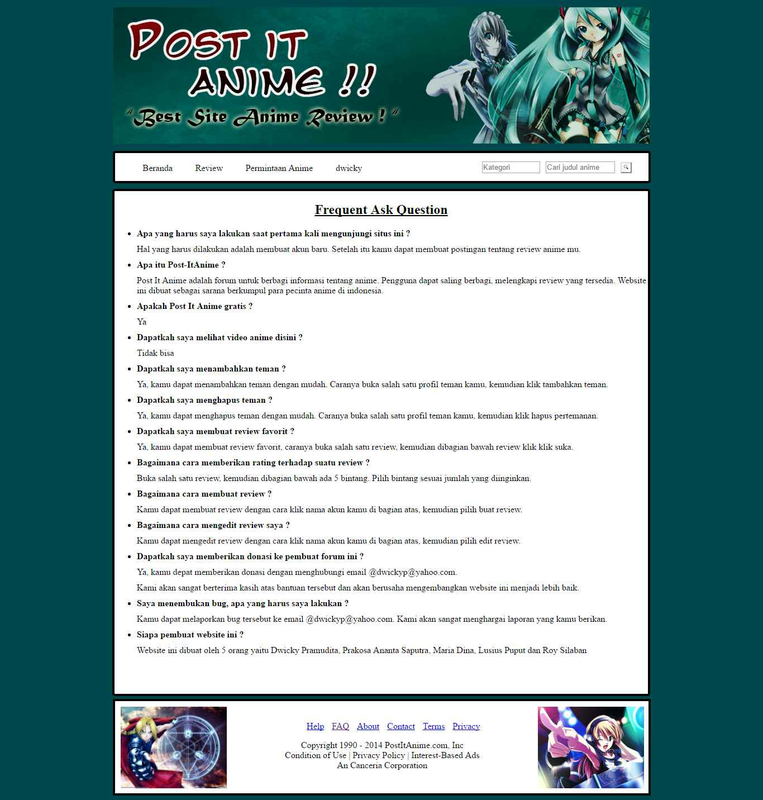 Hopefully anime indonesian lovers can share information, experience, and establish communication with others easily. 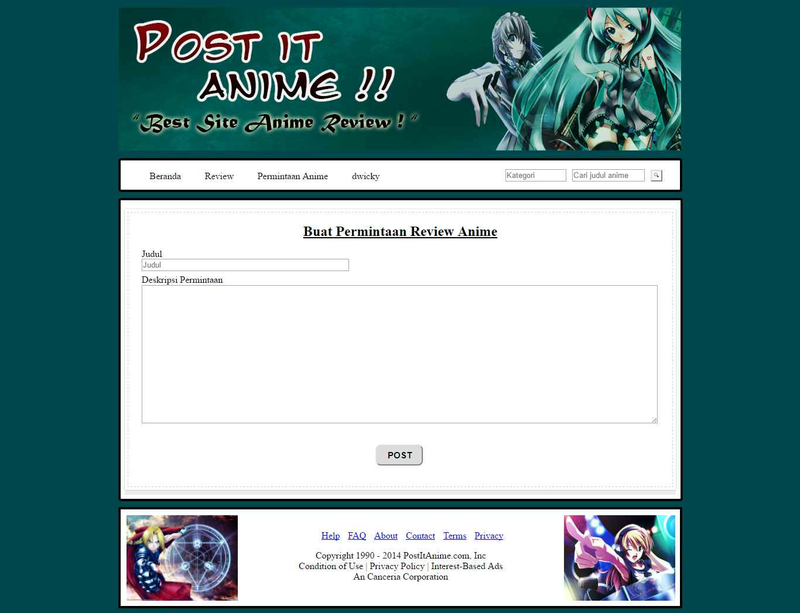 Features contained in this website are user accounts, Anime review, comment, anime review request, rating, search filter, share social network. 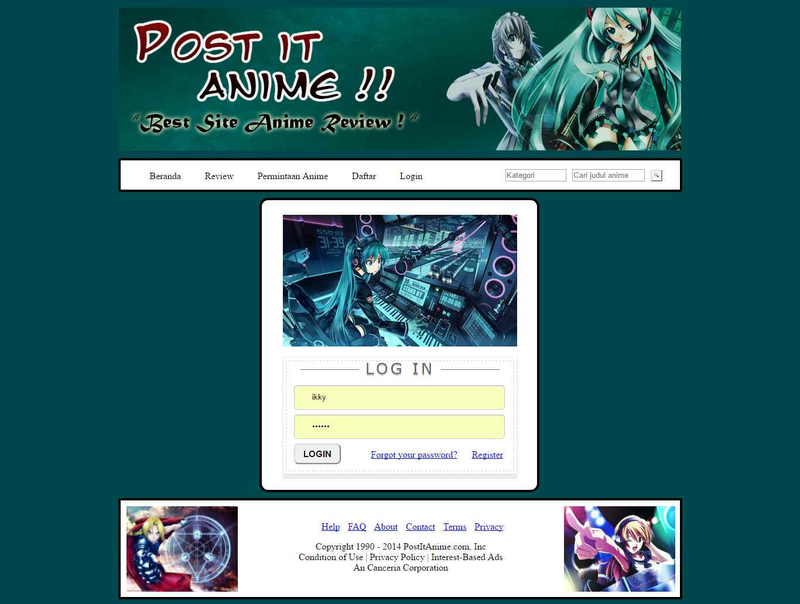 This website is created using PHP, HTML 5, CSS, JQuery, Ajax. Comic lending information system is a system that can be used by rental managers or rental comics to facilitate in the recording, both lending transactions, purchases and management of rental members. 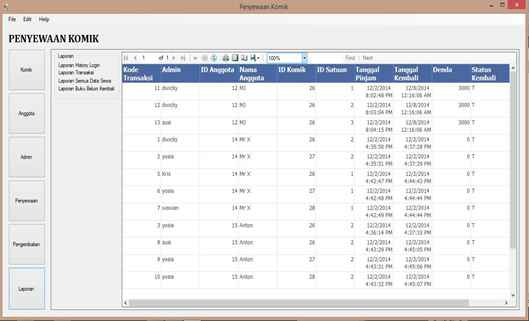 This program has features User management, Data processing, Logs, cost calculation, search, sorting. This program is created using the VB programming language net. 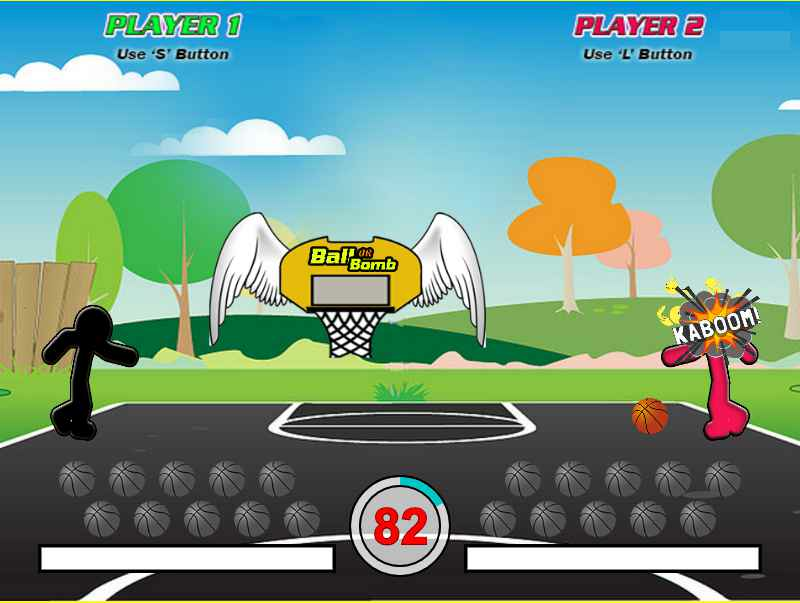 Student activity manager is an application to record activities that must be done, in this case especially students. 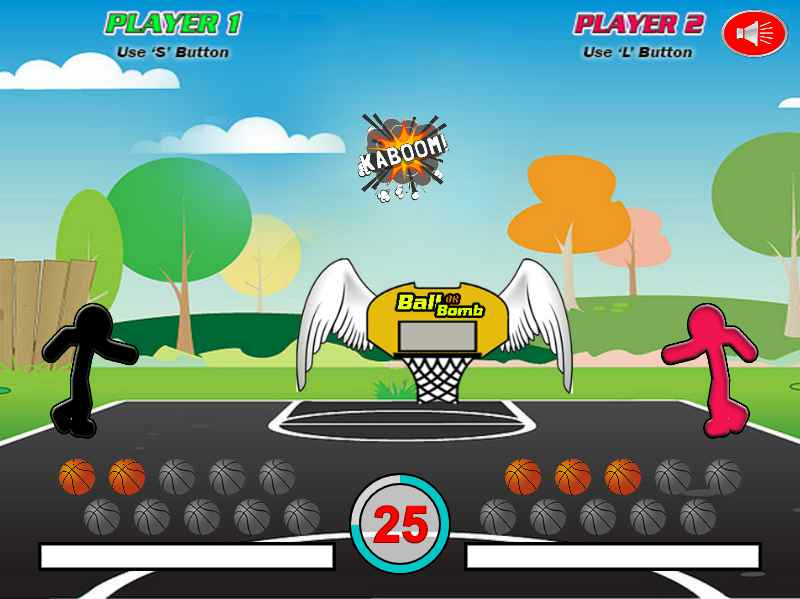 This application is created as the final task of a course. This app has some features like Notification, System Tray, Undo, Redo, Log, Calendar, Search and sort, etc. This program is created using Java Programming Language and Eclipse IDE. Use one of these social media? This is the fastest way to contact me. please contact me with one of these social media.